Suicidal Tendencies focuses on this incarnation of the Suicide Squad and features a confrontation between the Arrow and the Atom. Previously in Arrow 3.16 “The Offer”: Ra’s Al Ghul pretended to be the Arrow. 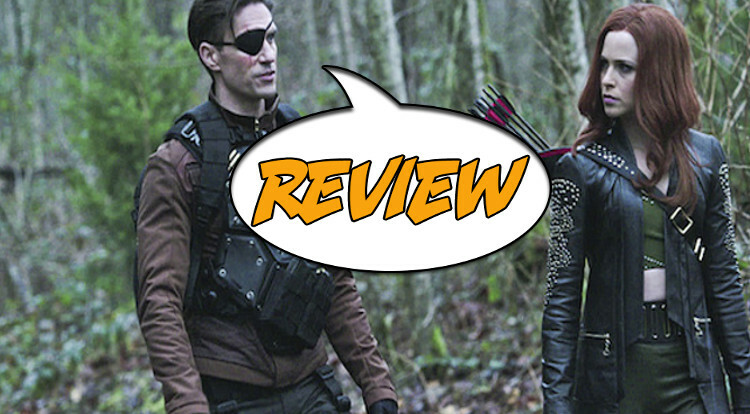 Suicidal Tendencies is probably the best episode we’ve seen from Arrow season 3, but that might not be saying much. Jesse Warn does a solid job on the direction and manages to pull decent performances out of almost the entire cast. The best thing about Suicidal Tendencies, though, is David Ramsey in the role of John Diggle. … let’s leave aside the fact that the name of the episode is in extremely poor taste and not at all a clever allusion to the Suicide Squad and focus on everything else. In the first act of Suicidal Tendencies viewers get to witness the wedding of John Diggle and Lyla Michaels (Audrey Marie Anderson, who does a solid job in the part), and highlights the fact that Olive Queen (Stephen Amell), is trying, albeit still unable to function as a real person in the real world. Not only does Oliver arrive late to the wedding, but he can barely keep a straight face when Felicity (Emily Bett Rickards), shows up with her new boyfriend, Ray Palmer (Brandon Routh). Just when thing are going really nicely Amanda Waller (Cynthia Addai-Robinson, who has been consistently terrible in this role), steps into Suicidal Tendencies to assemble her Suicide Squad – in this incarnation it is made up of John, Lyla, Deadshot (Michael Rowe), and Cupid (Amy Gumenick). It’s not a bad idea at face value and could have gone on to be a truly compelling plot if Amy Gumenick’s Cupid were not so over-the-top to the point of being a caricature rather than a real person. Michael Rowe’s performance as Floyd Lawton/Deadshot is actually really, really solid throughout Suicidal Tendencies. Despite the fact that he wears an army outfit that is utterly fictional to the show and bears the rank of a First Sergeant (one of the highest enlisted ranks a person can have – which means it’s a desk job), and would not have fired any shots, much less the plethora of sniping he purports to have, Rowe manages to overcome Keto Shimizu’s blunders and deliver a good performance – particularly in the flashbacks. Shimizu’s inconsistencies carry through into Floyd Lawton/Deadshot’s present day storyline in Suicidal Tendencies, to the point where he is downright empathetic to John Diggle – a character he has spent each of his previous appearances attempting to murder. These inconsistencies are jarring and they all compile to undermine the final emotional beat Shimizu has layered in where Floyd Lawton is supposed to sacrifice himself in order to save Diggle, Harbinger and Cupid … although comics being what they are viewers can also feel secure in the knowledge that Deadshot won’t be down for long. Brandon Routh’s Ray Palmer stumbles his way through Suicidal Tendencies and it becomes evident about halfway through the episode that he is nowhere near as good an actor as Stephen Amell. The Atom makes it his personal crusade to bring down the Arrow (and just a little bit of that is to get back at Felicity), and leaving aside the completely hokey way that he deduces Oliver’s identity, Routh just does not deliver a single good line reading when he can’t rely on being a smarmy hot head. As a result, the beats that rely on the Atom getting emotional and baring parts of himself fail where Felicity shines under moments of duress. I wish I could disagree with you on the episode’s quality of performance. But I can’t. I think it’s a little sad when the guest stars and recurring extras can turn in a more thoughtful and enjoyable performance than some of the primary cast. I have to agree that it really stood out how much better actor Amell is when Arrow and Atom met in costume.